Danica Patrick Shows off her new Sprint Cup Car at Stewart-Haas racing press conference. Today's press confrence by Stewart-Hass racing unvieled the new Sprint Cup car that will be driven by Danica Patrick. 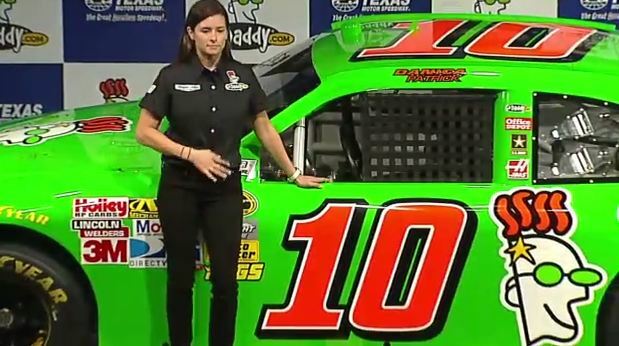 The #10 GoDaddy car will be making limited starts with Danica driving as she will drive in the NASCAR Sprint Cup in 2012. There was some fun banter between her and Tony Stewart and Tony mentioned how he understands the language Danica will bring over to the team because he came from Indy cup racing also. Some tracks she mentioned were Bristol, Darlington, Atlanta, Chicago, and Daytona but she wasn't exactly sure what races she will drive in as her main focus was the full time Nationwide series schedule.